Today I have the honor to have BeachSky to share with us some of his personal collection of Singapore Mcdonalds Happy Meal Toys from 1980s to 1990s. This would be a walk down the memory lane for some of us. 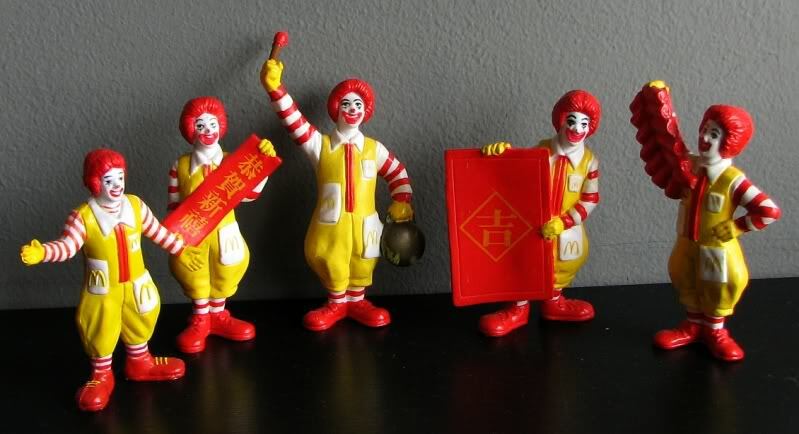 In the late 1980s, Mcdonalds had some brilliant marketing to have some Lunar new year Happy meal toys and here are some of them. Ronald McDonald Lunar New Year greetings. Update: Thanks to Juliana, The 4 dragons are 富 (yellow), 贵(blue), 吉 (green) & 祥 (purple). Remember the Muppet Babies? They have their own cartoons in the late 80s. I remember everyone of these in the series had a vehicle. Some of them missing in photo was Kermit the frog which is my favorite. Chip Chip Chip & Dale! 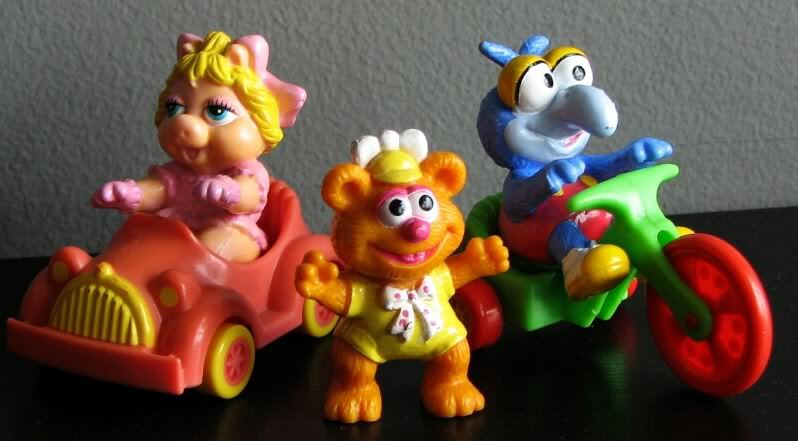 Rescue rangers was a spinoff cartoons that made it in McDonald Happy meal toys. Vehicles seems popular to kids. Here's Garfield on vehicles too! And Fraggle Rock by Jim Henson on vehicles.... I will always remember about "Dear nephew Gobo...." where the uncle went outerspace which is our world amusing. Updates: Here's is the answer to my question. If you know anymore information on them, do comment so that we will all know the truth. Feel free to comment if you have more vintage Mcdonalds toys to share. The last photo shows the "singing McNuggets". They came with hats and belts and if I recall correctly, their overall dressing were like cowboys and cowgirls. Thank you for the info. I do remember the Nuggets come with hats like cowboy now. Yeah, sorry about them missing the accessories.. but I managed to find them! Here's the updated pic of them wearing them although I am not sure whether are they wearing their correct accessories. Thanks BeachSky for the updates! Add in now! OMG... i used to have these! That's a nice gesture. Do take some photo to share with us too! I have some Kiasu figures but are not with me now. Guess got to bring them out in the future. Yes please! I didn't know Mr. Kiasu have their own figures!! I used to have some of them too but not mc nuggets. Remember when the toys were MCd's chracters and you only got 1 a week. Yes they still practice one a week thingy currently at our Mcdonalds for the toys. These childhood Mac toys are a joy to have!